support of female farmers to improve their income and receive greater social acceptance. The project setup also incorporates the principles of gender mainstreaming. Staff acquisition procedures have been adopted to promote a gender balance of male and female staff members. When this was not possible, it was compensated by female consultants and interns. Female and male project staff as well as counterpart staff have been trained on the integration of gender issues into all activities. 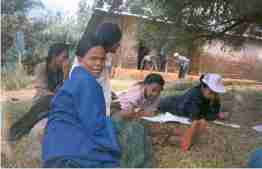 Participatory Land Use Planning (PLUP) and Participatory Rural Appraisal (PRA) activities were carried out actively involving the male and female population. The frame conditions (e.g. time and location of activities, flow of information within the community) have been considered in order to avoid disadvantages for the male or female target groups. In a number of surveys, men and women have been interviewed separately, where gender disaggregated information was desired. Generally, gender disaggregated data was used to analyse the existing situation in the districts and communities.